I’m SHOCKED at how many Christians aren’t generous tippers and givers—and many argue against the need to tip their servers at all! Are you the most extravagant giver among those you know? Do you tip passionately? Are you looking for opportunities to bless? Or, are you holding back, expecting others to serve you? Has a spirit of entitlement and poverty gripped your life? Here’s a truth that will set you free: If you expect other people, systems, the church, the government or any other entity to meet your financial needs, you are destined for a life of frustration and lack. However, if you are focused on giving to others, no matter your current financial condition, your joy will abound and your faith surrounding your finances will skyrocket. A spirit of poverty will cause us to keep the dollars that are actually meant to be sowed and multiplied back to us. A spirit of entitlement will result in a lack of gratitude, causing us to keep our money in our pockets while waiting for others to give us more. A spirit of offense will cause us to reject the call to use our money to bless others who we have determined don’t deserve it. These three spirits must be eradicated from our lives. I’m offering a powerful, free resource at the end of this article to help you find freedom. Keep reading. HOW COULD ANY CHRISTIAN ARGUE AGAINST TIPPING? I’ve heard arguments against tipping by Christians who honestly admit that sometimes they simply can’t afford it. I understand the seasons of scarcity, and I know that these seasons can come for a variety of reasons. Sometimes it’s our fault and sometimes it’s not. However, to presume in seasons of scarcity that we can still live large is a sign of these spirits having a root in our lives. Entitlement demands they experience life the same way those who prosper do. They argue they have a right to eat out just like everyone else, even if they can’t afford to tip. This is absolutely nonsensical. In fact, it’s selfish and rude to expect a server to wait on us and then to tip poorly or not at all. Everybody is in a different financial position, and some can afford to eat out, some can’t. Some can afford to buy a new car, some can’t. Some can afford to go to the Super Bowl, some cant. Some can afford a new computer, some can’t. Nobody has a right to things they can’t afford, including eating out. Some actually presume the tip to be an optional but unnecessary bonus for servers if they do a good job. I wonder how many people actually think that the majority of waiters and waitresses are mostly supported by their paycheck every two weeks. They aren’t. In fact, are you aware that most servers receive ZERO dollars in their paychecks? They live solely on the generous tips from those who are eating at their tables. Taxes on those tips wipe out the $2.13 per hour that most servers make today. This means, if I don’t tip $20 or $30 on my $100 check, my server may miss a student loan payment or they may not be able to buy their children new shoes or take them to the amusement park they were promised. I take this responsibility very seriously. I want every person who serves me to be more blessed than I was by the time the hour-long dinner is over. Our resolve to bless those who live on tips (servers, valets, hairstylists, bellhops, your Uber driver, etc.) should be a core value—even when their service is poor. My wife and I never decrease the tip by even a penny if we receive poor service. Why? There are many reasons. They may have had a bad day. The kitchen may actually be at fault. They are dealing with depression. Their family situation is bad and declining. They dealt with rude customers at their last table. Or, possibly, they have yet to meet Jesus. I guarantee I am not going to try to “teach them a lesson” by decreasing my tip instead of blessing them in the love of Jesus. If we can’t bless those who don’t refill our drinks quickly enough, how can we presume to bless those who use and curse us? When the Bible talks about curses, that includes verbal assaults, insults and all sorts of mistreatment. We don’t seek revenge. We don’t try to teach them a lesson. We don’t leave a nasty note on the check. 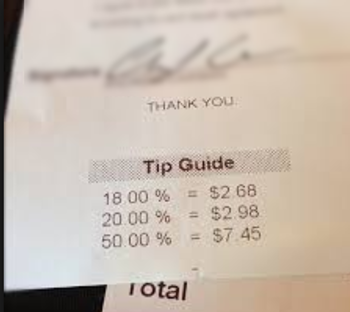 We don’t decrease our tip. We don’t attack them back. We love them. We bless them. We give. I know many who are reading this are rejoicing. Many Christians are tired of others being such a poor representation of Christ. Many servers are tired of dealing with selfish, entitled people. There is a black mark on Christianity because of many in the after-church crowd on Sundays who eat together. They can be demanding, loud, difficult to deal with, entitled and absolutely terrible tippers. It’s embarrassing and many Christians out there have had enough. I know servers who despise working on Sundays. Great job Christians. You’ve made quite a name for yourself. Here’s some advice: If you can’t love your server and financially bless them radically, just stay home. Nobody has the right to eat out if they can’t afford it. I was engaged in a Facebook discussion on this topic, and some came out of their skin with indignation that I would say such a thing. They feel no obligation to tip their server, and they believe their financial condition should have no bearing on whether they can eat out or not. I wondered if they also might just pay whatever they want instead of the total on the check. Do they just pay what they can afford when checking out at Walmart? Of course not. But, they choose not to pay their server’s bill (their tip). This is a clear indicator of being driven by poverty and entitlement. If you can’t afford to tip at least 20%, you can’t afford to eat out. Most definitely stay home or eat somewhere where tipping isn’t expected. In order to break free from from poverty and entitlement, we must crucify our flesh and become radical givers instead of expecting others to meet our needs. There are many mad people in the world. Mad at pastors, government, friends, their church family and others for not meeting their financial needs. This mindset will ensure they remain sad, angry, disillusioned and in lack. We break the demonic grip of poverty and entitlement by turning the tables and giving with passion instead of expecting others to give to us. The poor widow had every right to be bitter at the church and at the rich. The natural reaction when in lack is first to look to others to resolve our problem, and second to despise them when they don’t. The widow was applauded by Jesus because of her heart. She had the greatest need yet still gave everything she needed to live on. She wasn’t entitled, and, believe it or not, she didn’t have a poverty spirit. She certainly wasn’t offended. We have always tipped both in times of plenty and in times of lack. During our first year of marriage we were very poor, with (nearly) no money for Christmas presents and a sack of potatoes for Christmas dinner. We were barely scraping by. However, if we chose to eat out we calculated the tip amount into the cost when deciding whether we could afford to do so. I'm sure our server made a better living than we did at the time. It didn't matter. It's never appropriate to withhold what a server is due in an attempt to better our own financial situation. I remember that season very well! In fact, I still vividly remember standing next to the sack of potatoes in the grocery store in Cleveland, Tennessee 23 years ago wondering if we should use our few remaining dollars on it along with a frozen chicken. That was to be our Christmas dinner. We did buy the potatoes and had just a little cash left over. On Christmas morning, my gift from my wife was a belt (that didn’t fit) and my gift to her was a Jenga game (that she was upset I bought because we needed that $10 for bills). That afternoon we had friends over to eat our chicken and potato feast—and then my wife burned the chicken. One of our friends ran home to get a frozen pizza. We enjoyed a wonderful mashed potato and frozen pizza Christmas dinner! In that season finances were scarce, though we were working hard. Our car was bashed in on the passenger side and the doors didn’t open. We had to steer about 30 degrees to the right in order for the car to drive straight. We replaced the tires with $5 used tires once every couple of weeks due to the misalignment. We couldn’t afford a repair. The bottom line is we had almost nothing and we very rarely ate out. Why? because we knew our $40 check would end up being $50 after tip. Instead we’d eat at home or grab something from McDonalds. It wasn’t our right to eat out if we couldn’t pay our bill—including what was owed to the server. It wasn’t only our faithful giving to the church and to ministry that broke us out of lack. It was a “widow’s mite” attitude. We expected nobody to pay our way and we knew that we must be radical givers at restaurants and other places. If we couldn’t afford to tip, we stayed home. The same is true with the church. I can’t imagine how anybody would attend a church, utilize their children’s ministry, receive teaching and be welcomed with open arms without giving extravagantly. 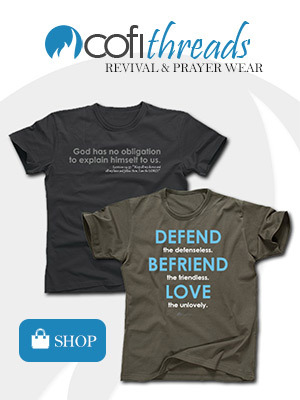 We should give radically to the church, period. We should attend church with the same attitude as when we eat out. We are there to bless them instead of expecting them to bless us. We want to give with passion. It’s true that the church is called to take care of widows. But, here’s the problem: when we stomp our foot and demand to be served because of this instruction in Scripture, we align ourselves with the spirit of entitlement and poverty, even though the church should in fact be helping. We should give and bless even when we aren’t taken care of in ways we should. Don’t blame, don’t point fingers. It's time to repent for a spirit of entitlement that is destroying our testimony. In a self-centered, narcissistic world, one can only presume entitlement would be in the mix, as well. This attitude is doing great harm to our testimony as Christians in addition to creating a proud, lazy people who expect to be served instead of to serve. I’ve heard about godly people who always tip double their check. I love this! While I wouldn’t suggest it’s mandatory to do this, I would suggest it’s mandatory to tip at least 20%. In fact, I’d encourage you to consider other opportunities to break off spirits of poverty and entitlement such as tipping double the check, paying for another patron’s check (including a huge tip), occasionally tipping five or six times the amount of the check or more and other opportunities to radically bless. When we give to others instead of demanding they give to us the spirits of entitlement and poverty lose their grip. Too many live offended lives. Offended that others aren’t taking care of them financially, offended that others are prospering and they aren’t, offended that they are continually overlooked. We should live free from offense. 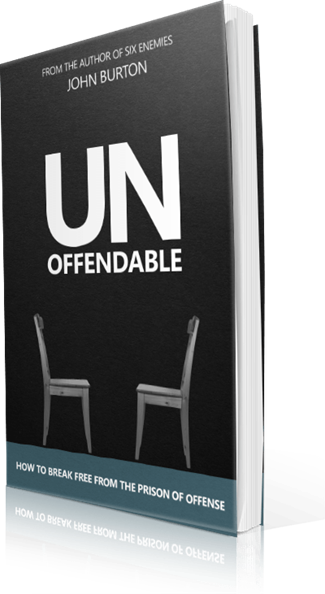 In fact, I’d like to offer my most popular teaching titled “Unoffendable” at no cost to you. Trust me, it’s revelation that will change your life dramatically! You will receive the audio teaching, the eBook and teaching notes at no cost whatsoever. You can get this powerful resource here: www.burton.tv/free. A spirit of offense is absolutely deadly. It will cause your love to grow cold and your heart to harden. It’s a death sentence. This spirit will cause you to rise up against others instead of serving them. Your unmet demands and expectations will result in a dark soul, a life of lack and deep resentment. This three-fold cord of poverty, entitlement and offense will imprison all who embrace these evil spirits. When we break these three spirits off our lives, and discover the power of Kingdom finances, we can live free and full of joy, no matter how much money is in our account. Faithfully giving and passionately tipping all who serve us out in the world will result in remarkable, prosperous, victorious lives! 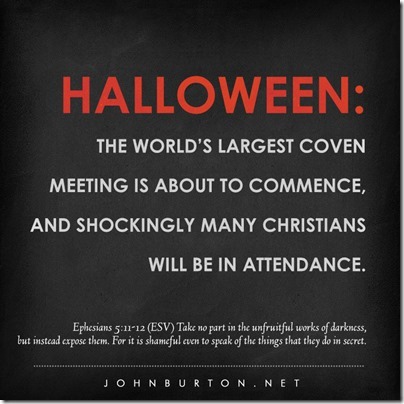 Halloween: Christians are putting their families at great risk by participating in Halloween at any level. 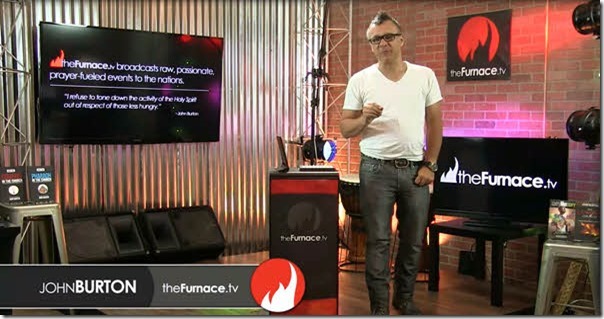 Listen to an old but powerful teaching on the dangers and wickedness of Halloween at www.thefurnace.tv/media titled Halloween: The Invitation. Over my last 25 years of ministry, I have had many encounters with witchcraft and the evil that is celebrated on Halloween, and I implore you to trust me: If you participate in Halloween at any level, you are at risk. There is nothing innocent about it and there is no way to sanctify it. The stories I could tell would make your skin crawl. The level of demonic activity around the world on this night should result in millions of Christians gathering together to pray on fire in response. We must understand that a key role for us as Christians is to expose darkness. Strangely, instead of doing that with anointing and passion, when October rolls around, Christians—actual blood bought servants of a holy God—are actually enjoying and promoting darkness. If we understood the evil that surrounds this unholy day, we’d shout from the rooftops the danger and evil that is overcoming our culture. There are things we are being entertained by that required a nail to be driven into the wrist of Jesus. Halloween is one of these things, and not only can we not participate, we must violently tear down this altar to Satan. As Believers we must not dance with the devil. We must expose his lies. Instead of wondering how to allow our kids to enjoy a more sanctified version of Halloween, we should understand that Halloween is a prime opportunity for Christian parents to teach their children about consecration and opposition to wickedness in our culture. We must teach them to deny their flesh and reject the spirit of the age that’s compelling them to bow! I propose we eliminate all supposed Christian Halloween alternatives and instead make it clear that we as Christians will have nothing to do with such a demonic celebration. We wouldn't look for an alternative to a night devoted to murder or child abuse, so how can we attempt to do so with a night devoted to witchcraft? It's an abomination. In fact, I'd argue that Halloween is in fact celebrating murder and child abuse. Instead of seeking an innocent alternative, hold a late night prayer meeting, with all of the kids and the entire family. Prayer walk the city. Pray in the Spirit. Instead of ignoring late night coven meetings as begin, we must counteract them with late night Holy Spirit intercession meetings. Instead of festivals to the dead, we need festivals of revival. We must aggressively expose the darkness and reject the party that is seducing our generation of youth.Reformers will irritate the church and the world, and with this issue many Christians and pagans are hand in hand. A holy irritation must come. The enemy’s strategy is to trap people, to ensnare them. The idea is that the person who is trapped is unsuspecting. They didn’t realize it was coming. Halloween is not a trap—it’s’ an outright invitation. 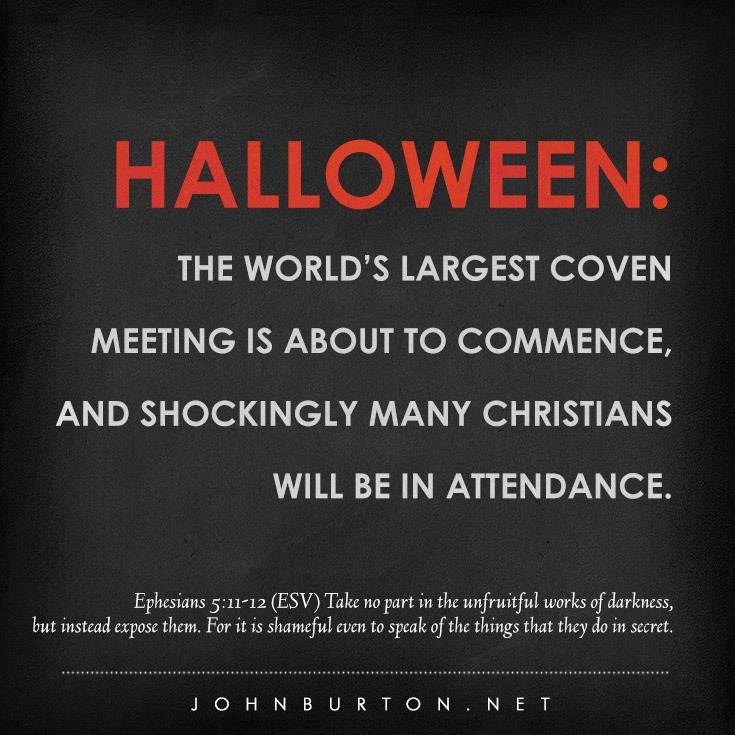 This is what makes it so shocking that Christians could even think of participating in Halloween at any level. Witches consider Halloween to be a high holy day. With such an important holiday, witches often hold two distinct celebrations. First, a large Halloween party for non-Craft friends, often held on the previous weekend. And second, a coven ritual held on Halloween night itself, late enough so as not to be interrupted by trick-or-treaters. If the rituals are performed properly, there is often the feeling of invisible friends taking part in the rites. Again, the terrible things Halloween represents must be exposed. Consider why costumes were worn.The early origin of costumes is repulsive. On the evening of October 31st, the Druids, who were the occultic priests and teachers of the Celts, ordered the people to put out their hearth fires. The Druids built a huge new year's bonfire of oak branches, which they considered sacred. They burned animals, crops and human beings as sacrifices to their sun god Muck Olla and Samhain, their god of death. During this diabolical ceremony the PEOPLE WORE COSTUMES made of animal heads and skins. They then practiced divination, looked for omens in the struggle of the victims sacrificed in the fires, jumped over the flames or dashed through them, danced and sang. All of this was done to frighten the evil spirits away. 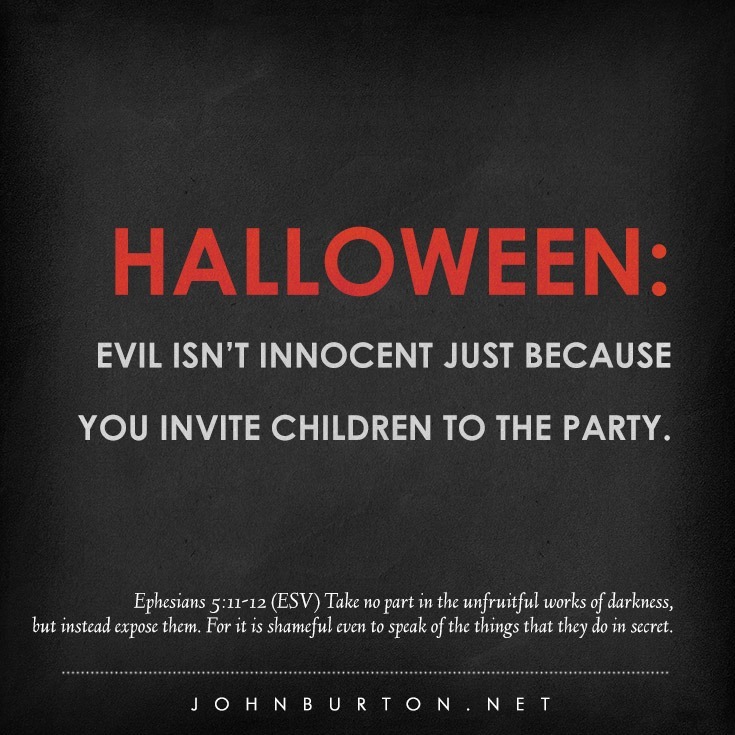 Children in costumes celebrating a night of candy and fun is not innocent. It’s an invitation into wickedness and it’s a dangerous affirmation of the evil spirit of the age. Lives truly are at stake. Dave Benoit tells of a mother finding a strange diary, called “The Book Of Shadows” in her son's room. She with fear and trembling leafed through pages filled with Satanic drawings. Then her eyes fell on these horrifying words, “Last year I stole a car at Halloween and ran over a kid and killed him. This year, at Halloween, I plan to do the same thing!” The words in his satanic diary proved to be true. The teenager is now incarcerated. He murdered a kid as a sacrifice to Satan. Those who practiced fortune telling and divination found that this was the night that they had the most success. To Witches, Halloween is one of the four High Holidays, or Greater Sabbats, or cross-quarter days. Because it is the most important holiday of the year, it is sometimes called ‘The Great Sabbat’, or the Black Sabbath. 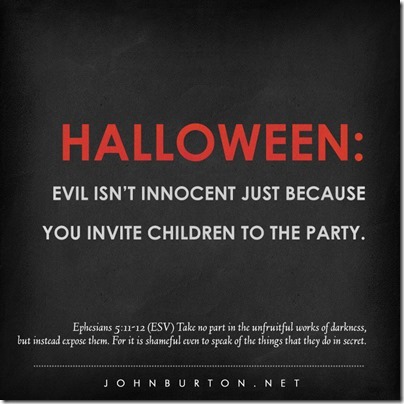 Yes, Halloween is pure evil through and through. More than any other night of the year, Christians have a chance to let their light shine as they expose the darkness. October 31st must be a night of intercession, not a party. Church, wake up and pray with passion for an increasingly dark world. That is my invitation. Watch: Does fear grip your life? You can be free! Don’t let fear of loss rob you of the fire of revival! If we fear loss of our our free time, finances, comfort and loss of command of our own lifestyle, schedule and plans, we will resist revival fiercely. Demonic fear must be replaced by a raging, shaking fear of the Lord! The greater our fear of God which comes through intimacy with him, the less our fear that’s initiated by the enemy will be. We won’t fear loss… we will understand that loss is a part of the process. Don’t protect what God may want to touch in your life. Isaiah 8:11-13 (ESV) 11 For the LORD spoke thus to me with his strong hand upon me, and warned me not to walk in the way of this people, saying: 12 “Do not call conspiracy all that this people calls conspiracy, and do not fear what they fear, nor be in dread. 13 But the LORD of hosts, him you shall honor as holy. Let him be your fear, and let him be your dread. The catch is this: If we fear God, the result is boldness and intimacy and power and confidence. If we have a spirit of fear, the result is timidity, reclusion, weakness and insecurity. Proverbs 19:23 (ESV) 23 The fear of the LORD leads to life, and whoever has it rests satisfied; he will not be visited by harm. WATCH OR LISTEN TO THIS POWERFUL TEACHING FREE FOR THE NEXT 30 DAYS HERE!